No need for a sound enclosure. Works with any Windows application! The ViewPlus Max Braille Printer is the fastest and most versatile of our Desktop series braille printers. If you don't want to pay for a heavy duty machine, but instead want a convenient desktop braille printer that still can handle larger paper sizes, the versatile Max Braille Embosser allows you to meet the challenge with ease. Because it's Powered by Tiger, you can be assured that it's quiet, easy to use, and the quality of braille and tactile graphics is unparalleled. 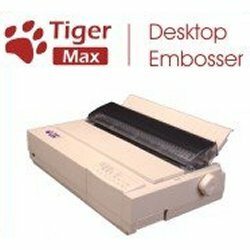 The Tiger� Software Suite is bundled with the ViewPlus Max Braille Embosser. * Paper Size Width 4" to 14"